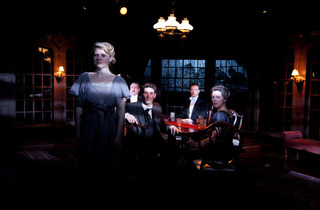 J.B. Priestley's 1945 socially-conscious whodunit still resonates in Remy Bumppo's production. 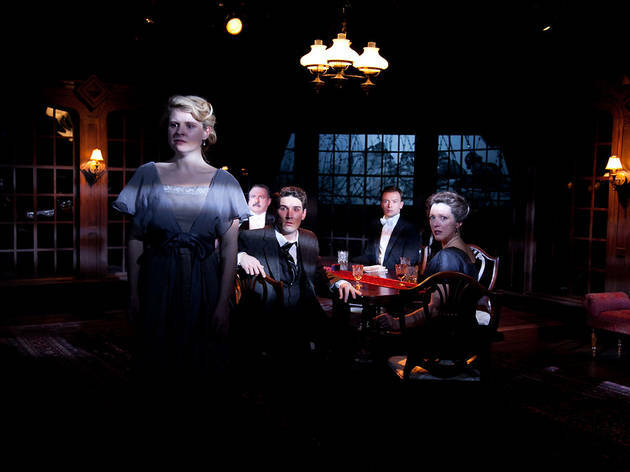 An Inspector Calls is a period piece twice over: first performed in 1945, just after years of war and economic and social tumult, and set in 1912, just before those upheavals. 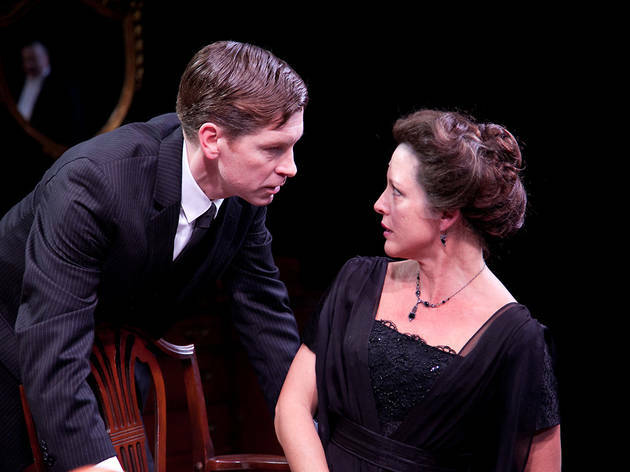 Those eras bookending the play were intentional; Priestley, a Yorkshire, England–bred socialist, set out to present more an allegory of social responsibility than a whodunit in the vein of Agatha Christie, though it’s been played that way for decades. Remy Bumppo’s production assuredly maneuvers through both of those qualities, though not quite with enough needed vigor to build tension in plot and stirring significance in meaning, at least not yet. 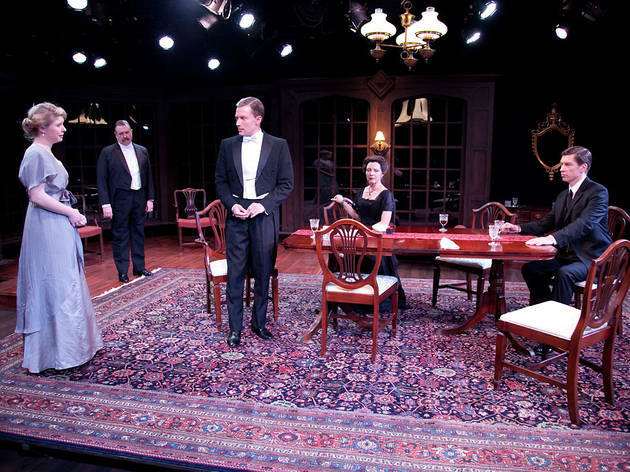 The performances by a stellar cast, led by Roderick Peeples as Arthur Birling, an arrogant businessman who has “a very good chance” for a knighthood, do highlight the play’s societal implications, at least in the older characters’ obtuseness about the world soon to change around them. “[Y]ou'd think that everyone has to look after everyone else, as if we were all mixed up together like bees in a hive—community and all that nonsense,” Birling complains. The family has gathered to toast the engagement of his daughter to the son of another captain of industry in their upstanding industrial town. Downton Abbey fans will find the Birling home familiar—plush rugs, after-dinner port, dinner dress, and secrets pushed under those plush Persians. Alan Donahue’s scenic design smartly has the faint outline of industrial buildings, likely the mill owned by Birling, watching over them. Then, an enigmatic police inspector—well, you know. 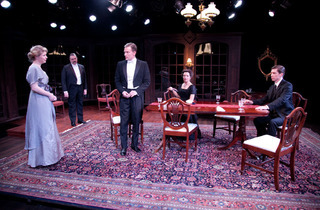 Inspector Goole quickly commandeers the Birlings’ cheerful evening to announce that a penniless young woman in the town has committed suicide that night. His pointed questions quickly reveal that the Birlings are involved in a cascade of awful events in her life, instigated by each of the family members, and a portrait of a kind-hearted but luckless young woman is sketched simultaneously with the capitalist, preening mores of the Birlings. Darlow directs the proceedings straightforwardly, if not reservedly; the play’s social implications feel a bit appended to the production. 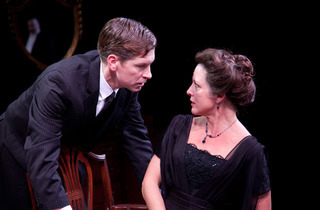 But given the emotional heft carried by the cast, including Isabel Ellison as daughter Sheila and Greg Matthew Anderson as her fiancé, who palpably feel the reverberations of their actions, both timing and meaning could tighten as this production moves through its run. And it’s Nick Sandys’s outstanding Inspector Goole who will steer in that direction, rendering both fire and restraint as he imposes their penance on them, reminding us that in the callous mingling of the Birlings with the doomed girl, we too are susceptible to their sins. “We are responsible for each other,” he insists, a lesson that should prevail in any era.